Saregama announces Kailasa’s first ever World Tour! 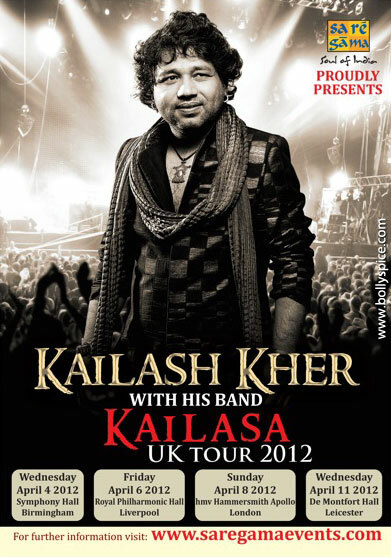 Saregama is extremely proud and excited to announce Kailash Kher and his band Kailasa’s first ever World Tour. Kailash is a revered Indian singer, lyricist and composer whose prodigious vocal gifts, poignant writing and inspiring personality have made him a household name across the globe. 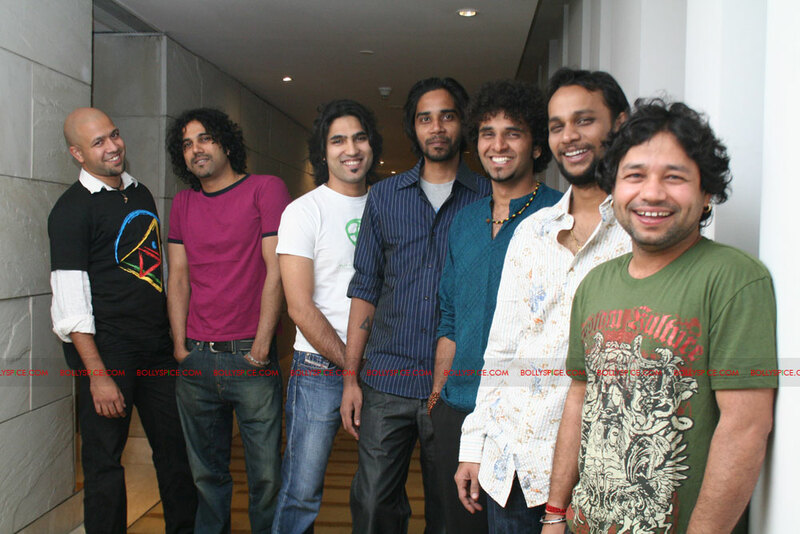 Kailasa, formed in 2004, is made up of Kailash and brother duo Naresh and Paresh Kamath. Kailash’s rich, powerful voice has earned him comparisons to Pakistani legend Ustad Nusrat Fateh Ali Khan, but his populist approach and knack for writing catchy hits with his band have helped him bridge the divide between traditional and contemporary styles. Since 2001, his credits include over sixty different film soundtracks and nearly two hundred jingles, plus stints as a judge on popular television shows, such as Indian Idol, IPL Rockstar, Sa Re Ga Ma Pa Li’l Champs and Kurkure Desi Beats Rock On. The world tour kicks off in the UK on April 4th, 2012, visiting prestigious venues in London (HMV Hammersmith Apollo), Birmingham (Symphony Hall), Liverpool (Philharmonic Hall) and Leicester (De Montfort Hall). The tour will make a pit stop in the Netherlands before moving on to North America. Kailash will cover 20 cities with his band Kailasa, performing crowd favourites like ‘Allah Ke Bandey’, ‘Teri Deewani’ and ‘Saiyyaan’ amongst many others. He will also perform tracks from his highly anticipated upcoming album ‘Rangeele’, releasing on the Saregama music label in January 2012, and Nusrat classics like ‘Sanu Ek Pal Chain Na Ave’ and ‘Ishq Ka Rutba’. “I’m delighted to be a part of Saregama’s initiative to bring Indian artistes to wider audiences. It is through this platform that I can reach out to my UK fans and look forward to performing across the country. I’m privileged to be a part of this musical journey and to enlighten people through entertainment.” – Kailash Kher. Combining Kailash’s strong traditional folk sensibilities and lyrics invoking Sufi mysticism with Naresh and Paresh Kamath’s more modern rock, electronic, and funk influences, Kailasa has proved to be a big hit with audiences in India and abroad. The band has given its listeners songs which have components of World, Lounge, New age and Dance music incorporated into their trademark Sufi tradition. The revolutionary sound has helped them carve a niche among their audiences, making them one of the first Asian bands to perform at The Hollywood Bowl and various world music festivals such as The Stern Grove, The Brooklyn Festival and The Parramasala Festival. Kailash has also performed at high profile venues such as The Royal Festival Hall and Wembley Stadium – London, The Santa Monica Pears – Los Angeles, Webster Hall – New York and more. “This will be the seventh groundbreaking live extravaganza to be organised by Saregama Events. As we have done in the past, we promise to bring something special for Indian music connoisseurs in the UK. Kailasa’s unique brand of music and Kailash Kher’s extensive repertoire will appeal to the NRI and South Asian Diaspora as well as lovers of world music. Judging by Kailash and his band Kailasa’s ever growing popularity at home and abroad, the 2012 concert tour is sure to be standing room only.” – Amarpal Singh Gaind, Saregama PLC, Head of Operations – Europe. “The moment I heard him, I knew that here was a voice that was so wonderful, and which had its own unique space… I want to say that Kailash Kher’s voice has something that had been lacking a lot – it had pure soul!” – A R Rahman, Academy Award-winning composer.